On the 7 June the Euro08 started in Switzerland and Austria. We are about 20 minutes east of Basel, Switzerland and I work in that city and commute from Germany across the swiss border. On Thursday, Liam and I spent the day in Zurich, Switzerland (about 30 minutes east of where we live). We usually take the train, faster and less hassle with working traffic. 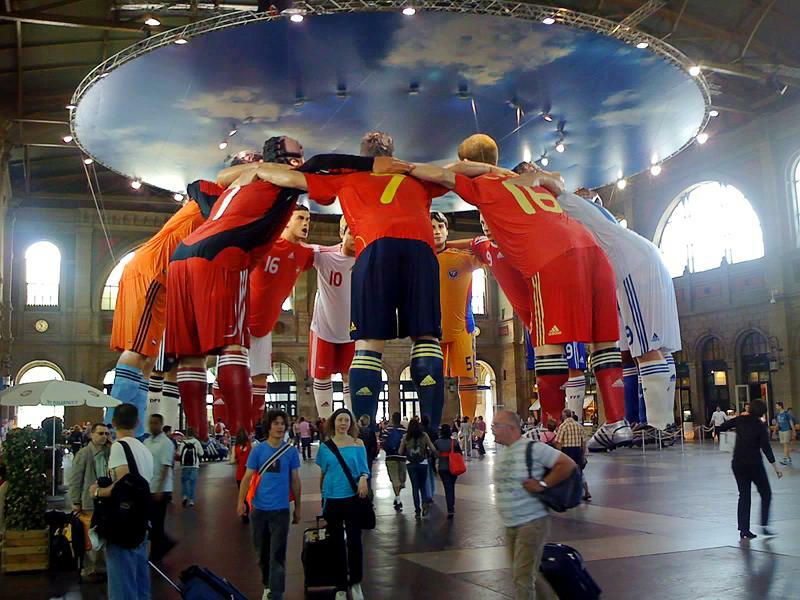 When we got to the Bahnhof (train station) they had these giant statues of the teams. It was amazing! They were so life like. The uniforms were actual material so as the breeze went through the bahnhof you can see them moving which gave it a more realistic feel to them. On Saturday, Marc, Liam and I made the mistake of going into Basel to do some shopping. That night the Netherlands were playing Russia. 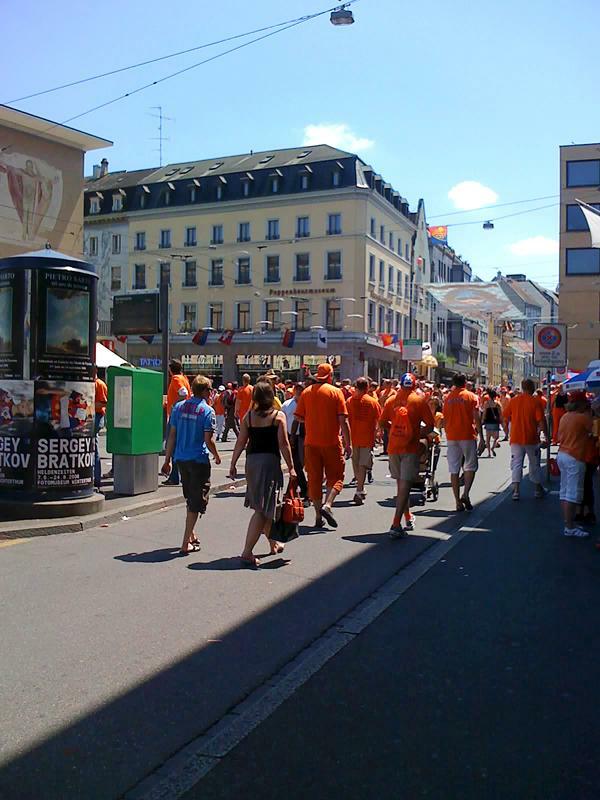 The town was flooded with orange fans for Holland. Over 100,000 fans supporting the Netherlands were everywhere it was fun and crazy. The news reports say that over 80,000 people left the Netherlands to head to Switzerland. I guess the other 20,000 were the swiss, they lost and were out of the play last week. Here are some photos, not good, I took them with my phone camera. I didn't have my Nikon with me. So the phone had to do. Below is a quote from the Euro08 page about that nights game with Netherlands vs Russia. reached the end of the road at UEFA EURO 2008™. team they most wished to see triumph after the co-hosts' elimination. course we are disappointed, we didn't expect to be eliminated,"
least one Dutchman will become a European champion." haha! i used to live in Germany next to the Dutch border. The Dutch are the friendliest bunch of people i have ever met. i used to do all of my shopping over the border because the atmosphere in the markets etc was so good!! 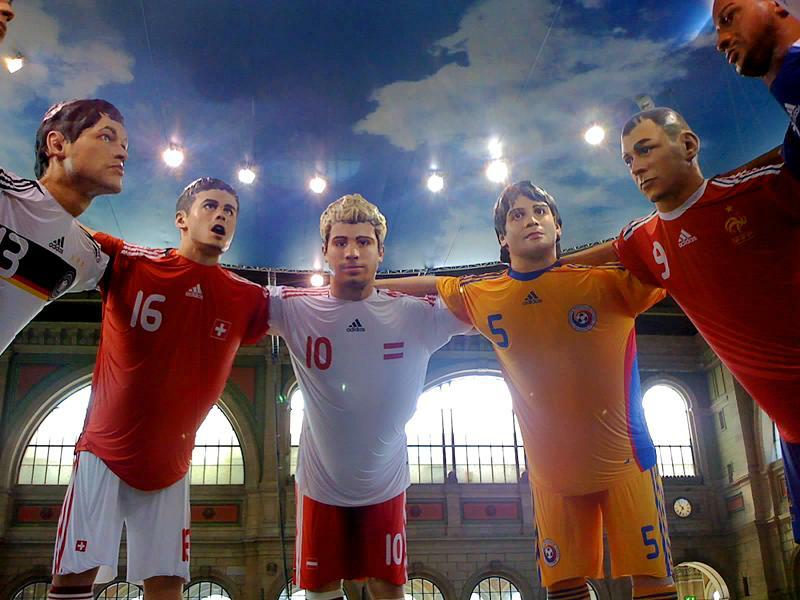 those footballer statues are amazing!! When I first saw you post, I scrolled before I read, and was like, what is she doing some kind of project. Like Giants and the wee people. I thought it was Photoshopped and you were superimposing people on top of Giants. Then I read the post... That is great camera phone, the pics are excellent. Cup fever is a little crazy! Makes for super shots Emily, especially from your phone cam. Australia has qualified for the Asian Cup, we need to win that to be in the World Cup. It has been crazy around here and will continue until the end of the week at least. My handy camera is only 2 mpixels. I never used it before so I had no idea what it would give me and it took me about 10 minutes to figure out how to use the darn thing. Good thing Liam was asleep in his buggy while I was trying to get it to work.